WASHINGTON, D.C. (March 24, 2011) -- Congressman Dennis Kucinich (D-OH) today wrote to President Obama that it was improper to commit the United States to a military intervention in Libya without prior Congressional approval and clear objectives. Kucinich questioned the criteria used for intervention and informed President Obama of his intent to introduce a bipartisan amendment that would cut off all funds for the U.S.'s role in Libya to the next funding measure to be considered. The letter was sent immediately upon the President's return to the United States from a trip to South America that began after the President announced U.S. participation in military intervention in Libya without seeking prior Congressional approval for the use of military force as required by the Constitution . Kucinich's amendment to defund U.S. military intervention in Libya is cosponsored by Representatives Walter Jones (R-NC), Pete Stark (D-CA) and Ron Paul (R-TX). See a signed copy of the letter here . The full text of the letter follows. I write in response to your letter of March 21, 2011 to the House of Representatives, regarding the commitment of U.S. Armed Forces to Libya. As the United States and its allies continue military intervention in Libya, I am deeply concerned about the White House's neglect of its responsibility to seek Congress' authorization to use military force prior to the commitment of U.S. armed forces. I am equally concerned about the potential for further instability in the region as a result of U.S-led international intervention in Libya. Not only were those preconditions not present, but Congress was available to consider a presidential request for authorization to use military force, had you chosen to submit one. It is deeply troubling that in the weeks leading up to the passage of the U.N. resolution, you neglected to come to Congress for authorization to use military force. Your efforts to gather support from the U.N., The Arab League , and other international allies prior to launching the strikes is well-known. Your neglect of seeking support from the U.S. Congress was not proper and contrary to your own publically stated understanding of the Constitution. 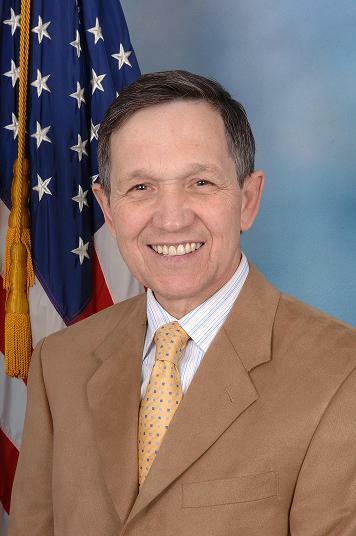 Dennis Kucinich is former US Congressman and two-time presidential candidate from Ohio who served 16 years in the U.S. House of Representatives. Kucinich Opposes Bailout, asks, "Is this the US Congress or the board of directors of Goldman Sachs?"